My Cluttered Corner: Fun with Hero Arts! Ok, I know I say, "I totally love..." a lot but when I say that about Hero Arts I truly mean it :) A few months ago I was a commenting fool on their blog because I hang out there all the time and my name was drawn to win $100 worth of their products. And not $100 worth of old or discontinued stuff sitting around collecting dust, mind you. $100 of whatever I wanted from the recent catalogue! That alone made me their customer for life ;) But you have to go over to their blog today...One of my cards was chosen as an honorable mention for the last weekly challenge. I am thrilled beyond belief. If you check out their Flickr pool it is jam packed with seriously amazing pieces of art work. So I was totally blown away to see mine up there on the blog. Go check it out! 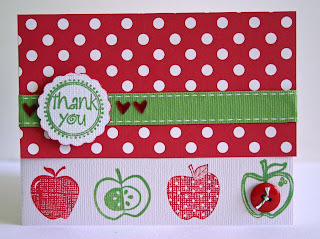 This is the card I made for the complementary color challenge (using red and green colors). I'm in love with polka dots right now!! Actually, you just totally inspired me. I have a card in my head. LOL!! Great job! oh CUTE! congrats on CMK guest designer! wahoo! I saw that!!! Congrats !!! Love that card.